There is a twist in the ongoing negotiation for a new minimum wage. Eight zonal public hearings are to be staged across the country by the tripartite committee on the new national minimum wage. The organised labour has raised its demand from N56,000 to N66,500, reports The Nation's Tony Akowe. Labour presented its memorandum to the tripartite committee, which was inaugurated on November 27, last year by President Muhammadu Buhari at the Council Chamber of the Presidential Villa in Abuja. The 30-member tripartite committee is chaired by a former Head of Service and Minister of Housing, Ms. Ama Pepple. Its members are drawn from the government (federal and state), workers’ unions and employers of labour. It was learnt yesterday that the zonal hearing would be conducted in the six geopolitical zones as well as in Lagos and Abuja, beginning from April 23. 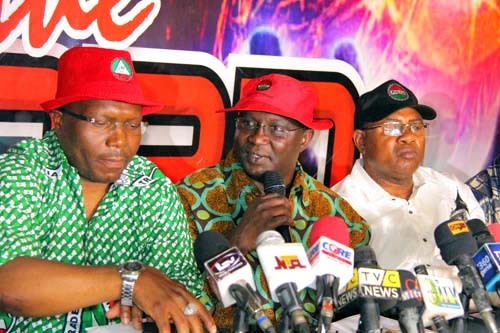 The Nigeria Labour Congress (NLC) President, Ayuba Wabba, who confirmed the upward review of the demand and the conduct of the zonal public hearings, was, however, silent on the new figure proposed to the government for consideration. Wabba, who said mentioning the figures was of no relevance at the moment, explained that the organised labour considered the prevailing realities including certain variables and current inflation to make an upward review of its demand. The fresh demand is N10, 500 higher than the labour’s initial request. Earlier in February, the NLC made a request to the tripartite committee on minimum wage to increase the wage from N18,000 to N56,000 for the least paid worker. Wabba told reporters that the new submission from labour was not different from the initial submission, saying “we made a demand almost two years ago and that demand was the beginning of the process. “The demand of Labour was based on the agreement we had on the five-year circle, which we believe was due and also considering the level of inflation, we made a demand of N56,000. “At the tripartite level, after the committee was constituted by Mr. President, all state governors and employers of labour, including the private sector and organised labour were requested to resubmit their memorandum to the committee for discussion to commence. “Therefore, states have submitted their own memorandum, the Federal Government and the Nigeria Employers Consultative Association (NECA) have submitted theirs. Jointly, labour has resubmitted its own memo. But what we did was to look at the dynamics of the times because the discussion will be evidence based. “So, we undertook a study and made a submission. This is the logic and not that we have submitted a new position. It was the same memo that we submitted, but what we did was to look at the indices because a lot have changed between 2015 and 2018. “So that cannot be regarded as a change of position because the process of arriving at a minimum wage in line with Convention 121 is evidence based. Everybody submitting memo or document will have to back it up with logic and not just quote figures from the air. “If due to inflation, there have been minor changes; we thought that should be done because; we felt that is what the opportunity is meant for. That document has been submitted and not a new document. It is just that we felt that there are new variables which we felt should be strengthened. “Every variable that is supposed to be considered for a discussion on the new minimum wage has been considered. We looked at the current realities to present a very robust position especially inflation. They are variables that are outside our control which you must use. “Clearly, what I want to inform you about is that we are committed to what we have. Yes, we have changed the variables, but the principles and the logic have not changed. Every other organisation will do same. “Even at the tripartite level, every memo is presented by the organisation which will be made public during the public hearing at different location across the country and each state is expected to make their presentation. “Some states have made their presentations to us which we felt is reasonable. For now, NECA, labour and states have made their presentations and they are already being considered. “The public hearing will begin on the 23rd of April across the six geopolitical zones and states within each zone will converge at the venue and organised labour in the zones will also make presentations. The Minister of Labour and Employment, Dr. Chris Ngige, who doubles as the tripartite panel’s vice chairman, has repeatedly assured that a new minimum wage will be implemented from the third quarter of this year. The latest of such promise by the minister was on February 27 during the 40th anniversary of the NLC in Abuja. Ngige said: “Well, we all know the economic situation of the country as of today. The negotiation committee has members from all the tripartite bodies, which means the government cannot force its way. It was learnt that the NLC and the Trade Union Congress (TUC) submitted a new request for an increase of the national minimum wage above N56, 000 per month to the minimum wage committee. The disclosure was made at the 11th Quadrennial Delegates Conference of the Nigeria Civil Service Union (NCSU) by the acting NLC chairman, Kiri Mohammed, on February 8 in Abuja. Mohammed said the demand for its upward review was as a result of inflation and other economic realities in the country. He said: “We submitted our request, NLC has decided to look at the figure and modify it, we actually modified it, an upward review above N56, 000. When confronted with reports that indicate that the new minimum wage may not be paid this year as it was not captured in the 2018 budget, Mohammed restated the President’s commitment to the implementation of the outcome of the ongoing negotiations for new wages for workers. Explaining why the government would implement the recommendations of the tripartite committee on minimum wage, the acting NLC chief said: “Who made the budget? I believe if they (government) are serious, we can finish this matter towards the middle of this year (June, July). The Director-General, Budget Office of the Federation, Ben Akabueze, said that though no provision was made concerning the minimum wage in this year’s budget, the Federal Government would prepare a supplementary budget that would take care of the increase in workers’ pay after the new minimum wage proposal has been approved. Wabba, had at the 40th anniversary of the NLC said that labour would resist the schemes of whoever works against the realisation of the new minimum wage within the government. The workers had an ally in House of Representatives Speaker Yakubu Dogara, who assured the NLC that lawmakers were prepared to support the payment of living wages to workers in the country. He encouraged the NLC to negotiate on living wages for its members. In a statement by its media office, the speaker was quoted as saying: “The major challenge facing the organised labour today is to negotiate a meaningful national minimum wage for Nigerian workers.